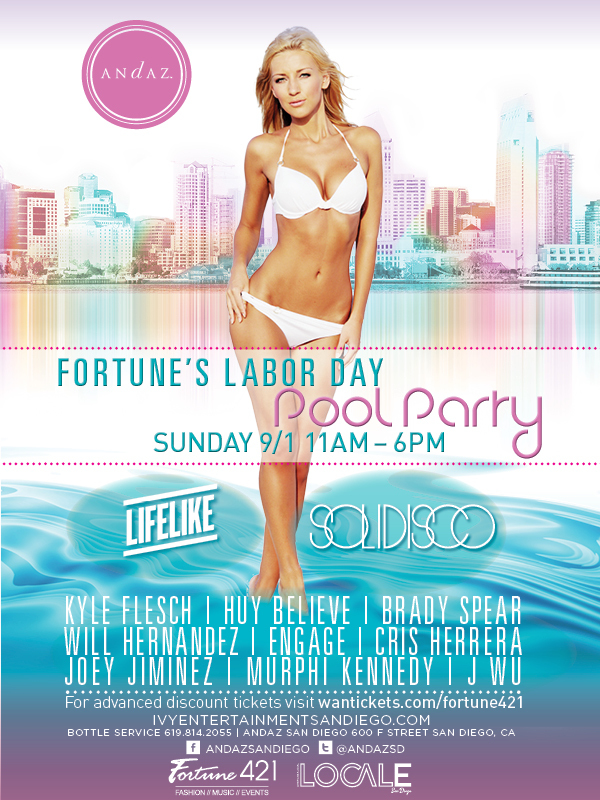 Andaz San Diego will wave goodbye to summer with a Fortune 421 Labor Day Weekend rooftop pool party on Sunday, September 1 from 11 a.m. to 6 p.m. Partygoers can expect a can’t-miss afternoon of celebrating with San Diego’s hottest socialites and scene-chasers as they sip on Andaz cocktails and listen to the beats of talented DJs. After sunset, pool party guests are encouraged to stay as the Andaz rooftop space, recently renovated and renamed RoofTop600 at Andaz, transforms into an outdoor lounge and San Diego’s leading DJs spin into the night. Headlining DJs will include Lifelike, a top dance music producer out of France, and Solidisco, a duo of quickly rising disco house music DJs hailing from New York. Additional DJs will include Kyle Flesch, Huy Believe, Brady Spear, Will Hernandez, Engage, Cris Herrera, Joey Jimenez, Murphi Kennedy and J Wu. In addition to being the social event during Labor Day Weekend, Andaz San Diego’s pool party will feature an assortment of playful pool toys and Fortune 421’s street style-inspired pop-up boutique. The boutique will feature the brand’s newest fashions, including screen print t-shirt and tank top designs for men and women alongside women's bikinis and men's board shorts. RoofTop600 at Andaz, downtown’s largest rooftop entertainment space, will also provide guests with a prime opportunity to indulge in the hotel’s popular signature bottle services. For further information about bottle service packages call 619-814-2055. 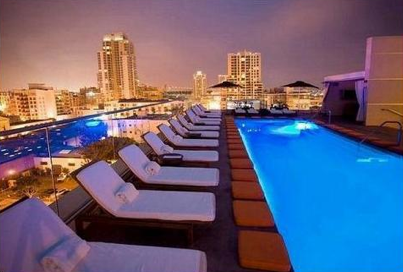 Rooms are available at Andaz San Diego per availability and advance bookings are recommended. For hotel rooms, please visit www.andazsandiego.com. 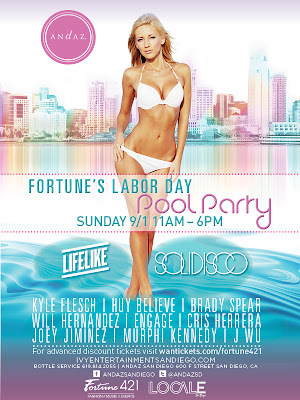 Tickets to Fortune’s Labor Day Weekend Pool Party at Andaz San Diego begin at $25 and are available online. Guests purchasing pre-sale tickets and using the promotional code “421” will receive $5 off the ticket price. Complimentary party bus services for ticket holders will depart from Thrusters in Pacific Beach at 12:30 p.m. For information about party bus services, call 916-201-2966. Pool attire is welcomed. Andaz San Diego is located at 600 F Street in San Diego’s Gaslamp Quarter. For more information, visit www.andazsandiego.com or connect on Twitter, Facebook and Instagram.